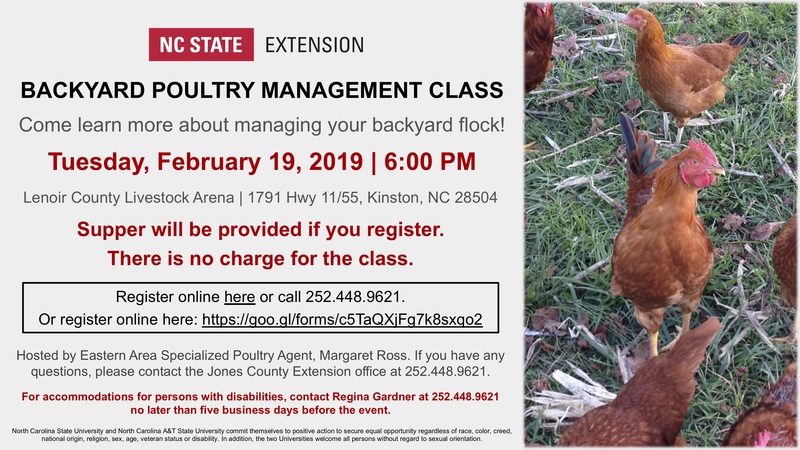 Please join us for a Backyard Poultry Management Class on Tuesday, February 9, 2019, at 6 p.m. where we will discuss topics to better manage your backyard flocks, as well as receive updates on how to receive information from important sources like the North Carolina Department of Agriculture and Consumer Services (NCDA&CS) when there is a disease outbreak. Please contact the N.C. Cooperative Extension of Jones County office at 252.448.9621 if you have any questions. You can register using this Google Form.